Post trades and orders using all popular order types and order flags. A market order is the simplest of the order types. A market order is a buy or sell order to be executed immediately at the current market prices. Market orders are filled to the extent there are willing sellers and buyers. You should use market orders when certainty of execution is a priority over the price of execution. A stop order, also referred to as a stop-loss order, is an order to buy or sell a stock once the price of the stock reaches a specified price, known as the stop price. 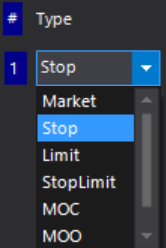 When the stop price is reached, a stop order becomes a market order. A buy stop order is entered at a stop price above the current market price. A sell stop order is entered at a stop price below the current market price. 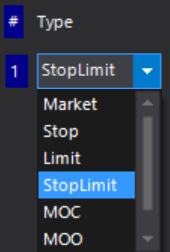 A stop-limit order will be executed at a specified price (or better) after a given stop price has been reached. 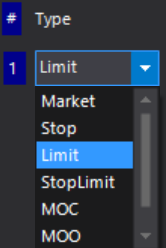 Once the stop price is reached, the stop-limit order becomes a limit order to Buy (or Sell) at the limit price or better. Market-on-close order or MOC is a market order that will be executed at or just after closing. 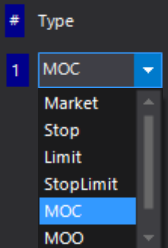 Traders sometimes use MOC orders as a limit order qualifier, which means that if a limit order isn't executed during the trading day, that order will be automatically canceled and then replaced with an MOC order. A Market-on-Open order is an order to be executed at the day's opening price. 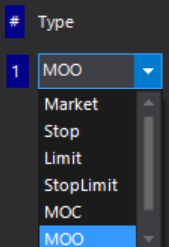 Market-on-Open (MOO)orders can only be executed when the market opens and at no other time during the trading day. Market if touched (MIT) is an order that will be executed only if a security reaches (touches) a specific price. A day order is one of several different order duration types that determine how long the order is in the market before it is canceled. A day order is an order to buy or sell a security that automatically expires if not executed on the day the order was placed. A fill or kill (FOK) order is an order to buy or sell a stock that must be executed immediately - a few seconds, customarily - in its entirety; otherwise, the entire order is cancelled; no partial fills are allowed. A Good-Till-Cancelled (GTC) order is an order to buy or sell a stock that lasts until the order is completed or cancelled. Brokerage firms typically limit the length of time an investor can leave a GTC order open. This time frame may vary from broker to broker. A GTD order - or Good Till Date Order - is a conditional request made to the broker (or the system) to keep the order in the system till a predetermined date, unless it is executed or cancelled. Place as many orders as you wish in one click. 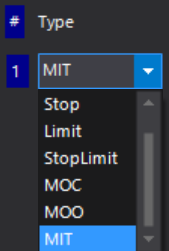 Place any order type, with any flag on the same instrument / symbol or on different ones. 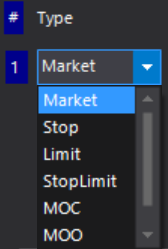 A Bracket order consists of a market order in one direction (buy or sell) and a pair of profit taking and stop-loss orders in the other direction (sell or buy). An OCO - One cancels the other - order consists of two orders who are mutually exclusive, meaning a fill on one leads to the cancellation of the other. An OSO - order sends order - order is a pair of orders in the same direction (buy or sell) that will exist only once an initial order, typically in the opposite direction (sell or buy), is being filled.